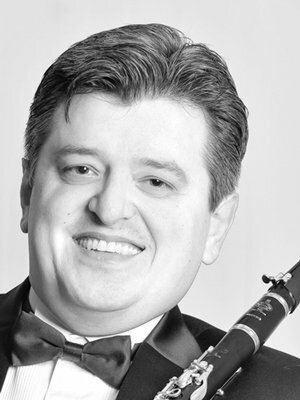 Vanguel Tangarov performs as principal clarinet for Austin Opera, Mid-Texas Symphony and Victoria Symphony orchestras. He has served as principal clarinet at Sofia Philharmonic Orchestra (Bulgaria), Academia Chigiana Symphony Orchestra (Italy), Jeunesses Musicales World Symphony Orchestra (Germany), and Monterrey Symphony Orchestra (Mexico). He has appeared as a soloist with Mid-Texas Symphony, with Plovdiv Philharmonic, Rouse Philharmonic, Varna Philharmonic and Sofia Philharmonic orchestras in Bulgaria, with Constanta Philharmonic in Romania, and with Monterrey Symphony and Monterrey Chamber Orchestra in Mexico. Equally popular as a soloist, recitalist and chamber musician, Tangarov has performed at Berliner Filharmoniker Hall (Berlin), Gewandhaus (Leipzig), Schauspielhaus (Berlin), Concertgebouw (Amsterdam), Oslo Konserthaus (Norway), Cadogan Hall (London), Symphony Hall Birmingham (UK), Bulgaria Hall (Sofia) and Zaragoza Hall (Spain). Tangarov attended the National Academy of Music “Prof. Pancho Vladiguerov,” where he received bachelor and master of music degrees under the direction of Petko Radev, former principal clarinet of Teatro Alla Scala di Milan. Tangarov received his doctor of musical arts degree from University of Texas at Austin under Richard MacDowell. He has also received instruction from Aurelian Octav Popa, Romania and Gerald Pahinger, principal clarinet of Vienna Symphony. Recent solo appearances include recitals at the 2015 Bulgarian Concert Evenings in New York and the Bulgarian Music Society 2015 concert season in Washington DC, as well as performances at the New England Conservatory and a solo/chamber music recital at the 2015 “Balabanov’s House Music Days” International Festival in Plovdiv, Bulgaria. Vanguel Tangarov can be heard as principal clarinetist on the recent Circus Maximus by John Corigliano (Naxos), on Samuel Barber: An American Romantic with Grammy Award-winning Conspirare (Harmonia Mundi), and on the soundtrack for Terrence Malik’s Knight of Cups.